The origins of the Gothic style can be found at the Abbey of Saint Denis in Paris. This 12th century structure incorporated all of the features of Gothic architecture, and so became the first truly Gothic building; the prototype from which numerous architects would draw inspiration in the centuries to come. For hundreds of years, the style dominated ecclesiastical architecture throughout Europe, only being gradually replaced by classical buildings during the Renaissance period. For hundreds of years, the Gothic style remained almost as a relic, waiting to be brought to life once more. The Gothic Revival was one of the most prolific styles of the nineteenth-century. It championed a return to the principles of medieval art and architecture and can be seen as a response to neo-classicism, which was rapidly dominating the architectural oeuvre. The nineteenth-century Gothic Revival movement was pre-figured by what is known as Strawberry Hill Gothic, of which Horace Walpole was both architect and inhabitant; designing his Strawberry Hill villa in the Gothic style – a home fit to accommodate his antiquities and his interests. Strawberry Hill by William Marlow, 1776–80. A.W.N. Pugin is perhaps the most well-known proponent of the Gothic Revival and his writings had a huge influence on the popularity of this style. At only twenty-three years of age, he assisted Charles Barry in the designs for the Palace of Westminster, and was in fact responsible for almost the entirety of its sumptuous Gothic interior. This included not only the internal fabric of the building, but the stained glass windows, the furniture and even the ceramics. One particularly fine table in our collection was designed by Pugin in a very similar style to those he designed for the Palace of Westminster. The table is carved from walnut, with a burr walnut and marquetry top sitting on a typically Pugin underframe. The table also embodies the style of the Arts and Crafts Movement, which was inspired greatly by Pugin’s writing and designs. It would have originally been designed as a library table but due to its generous size, it would make a lovely dining table, or centre table. Other famous figures of the nineteenth-century were also encouraging a return to both the aesthetic and spiritual values of the middle ages. John Ruskin, a revered art critic of his day, created numerous watercolours depicting some of the most beautiful examples of Gothic architecture both in Britain and Europe, and also wrote a number of seminal texts on architecture. He wrote against the mechanised production of the industrial revolution, calling for craft, individuality, variety in design and a retreat from the homogeneity of classicism. His influence saw a huge number of architects and designers incorporate these ideals, creating ambitious works of the imagination in stone, brick and marble. One such man was John Middleton. Orphaned from a young age, Middleton was left only a modest allowance which he used to train as an architect in the North of England. He did however manage to travel to Europe, which influenced his style a great deal. Middleton went on to design a number of churches, residences and even railway stations in the favoured Gothic style of the period. Some of the most beautiful residences and public buildings he designed were in Cheltenham, including the Cheltenham Ladies College. Nearly every private residence he designed had a grand chimneypiece. These Gothic creations were hewn from both stone and marble, with grand columns and bold carving, not so different in design from gothic sedilia. 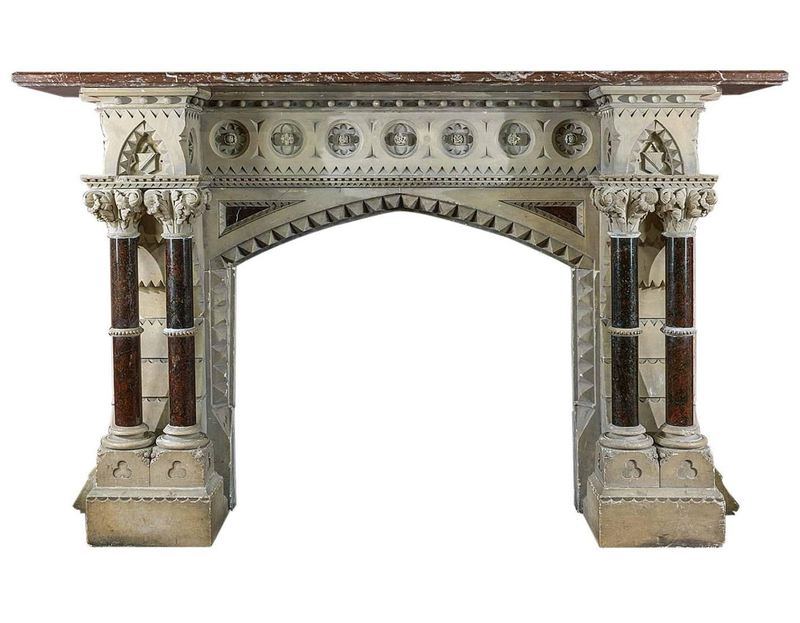 One chimneypiece in our collection is attributed to John Middleton, and is likely to have come from a grand Gothic Revival House in Cheltenham or its environs. It would have no doubt come from a room of grand proportions and it certainly would have made a magnificent centrepiece. The double columned jambs in Serpentine marble support a Languedoc marble shelf. The fireplace bears many attributes of Norman ecclesiastical architecture. This is not only due to Middleton’s passion for church architecture but also reflected the great religious revival of the nineteenth century; the Oxford movement perhaps being the most famous. This encouraged a return to Catholic architecture, the Gothic. Although the Gothic style remained prominent in ecclesiastical buildings, both public buildings and private homes were being designed in the Gothic style all over Britain, often with a view to reflecting the values of the owner. The Gothic Revival and the Arts and Crafts movement were inextricably linked and many pieces in our collection bear characteristics of both.